Linking the intense heatwave and drought to environmental degradation, Prime Minister Narendra Modi on Sunday made a strong pitch for a mass movement to save forests and conserve "every drop" of water during the upcoming Monsoon season. Modi, who has been reviewing drought situation with chief ministers recently, said a number of states have taken some good initiatives towards water conservation and that he had asked Niti Aayog to study the best practices for their replication all over the country. 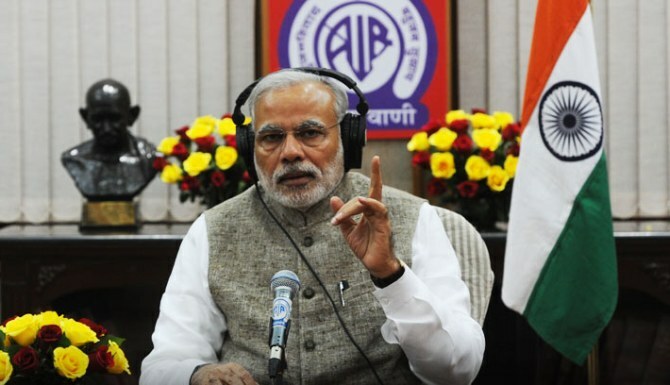 In his monthly radio programme 'Mann Ki Baat', he also talked about some other issues, like the need for moving towards cashless society for transparency and curbing blackmoney. During the 30-minute broadcast, the prime minister also urged the countrymen to practice Yoga for illness-free life and informed that on the International Yoga Day on June 21, he would join a programme in Chandigarh. Referring to the intense heatwave being witnessed in the country, he said concerns increased few days back when news came in that Monsoon could be delayed by a week beyond June 1. "Most parts of the country are experiencing intense heatwave. Be it humans, birds or animals, all are troubled...It is only because of environment that such problems continue to increase. Depletion of forests has been going on, trees continue to be cut. In a way, the humankind itself destroyed the environment and put itself on the path of destruction," he said. He mentioned the recent cases of fire in forests of Uttarakhand, Himachal Pradesh and Jammu and Kashmir, and said the root cause of such incidents is that there are dry leaves and little carelessness. "That is why, saving forests and conserving water becomes everybody's responsibility," Modi said while underlining the need for saving "every drop" of water, which he described as "God's 'prasad'". "I urge the countrymen, let us decide that we will not let even a drop of water go waste during June, July, August and September (comprising Monsoon season)... The issue of water concerns not only the farmers but everybody... The rainy (Monsoon) season is coming.. Start the preparations now to see where to save water," he said. "I urge you. Do not let this (Monsoon) season go. In the coming four months, a mass movement in the form of 'Save Water Abhiyan' is needed to save every drop of water. And this task is not only of the governments or politicians but that of the common masses," he said, seeking contribution from the media too in this endeavour. Emphasising that saving water should be a priority for the countrymen, the prime minister questioned how a situation can be allowed to persist wherein water is wasted during Monsoon and later there is problem of scarcity. "Even if one drop of water is wasted, it should pain us," he said. While talking about water-scarcity, he referred to his meetings with Chief Ministers of drought-hit states -- Uttar Pradesh, Rajasthan, Gujarat, Maharashtra, Madhya Pradesh, Chhattisgarh, Jharkhand, Karnataka, Andhra Pradesh, Telangana and Odisha. He said he had departed from the past tradition of holding a common meeting with the chief ministers and decided to meet them separately to give individual attention to each of them. "Whichever party may be in party in any state, it was emphasised that permanent solutions are required to deal with this problem which has been going on long. The focus (of these meetings) was how to have lasting solutions," Modi said. Describing it as a "learning experience" for him, he said he had asked Niti Aayog to study the "best practices" of various states so that those could be replicated in all the states. In this context, he said some states, especially Andhra Pradesh and Gujarat, had made immense use of technology to meet the situation of water scarcity. He mentioned various schemes being undertaken by different states like Uttar Pradesh, Maharashtra, Andhra Pradesh, Gujarat, Telangana and Rajasthan for optimal use of water. Maharashtra, Andhra Pradesh and Gujarat have set the targets of expanding micro-irrigation to 2-3 lakh hectares of land per year, which he commended. Citing the initiatives undertaken by various states, Modi said some are using micro-irrigation, some drip-irrigation, some ground water recharging while some others are using 'check dams'. He then spoke about the need for using technology to turn India into a 'cashless society'. "We have to build a modern India. We have to make India transparent...We will need to some of our old habits," the prime minister said. He spoke about the government's steps in this direction like introducing Jandhan, Aaadhar and Mobile phone banking. He also mentioned Point of Sale instrument and 'RuPay' mechanism of making payments. Pitching for cashless transactions, he said, "it will bring transparency... The impact of black money will reduce." The prime minister also referred to the upcoming Rio Olympic Games and asked the countrymen to contribute to encourage the participants from India. "An environment should be created to encourage the Indian participants... Everybody should contribute in his own way... Whatever may be the results. It is sports after all.. One may win or lose but the spirits should be high," he said. He had words of praise for Sports Minister Sarbananda Sonowal for visiting Netaji Subhash National Institute of Sports in Patiala to see the arrangements and facilities for the Indian participants of the Rio Olympics in the midst of assembly elections in Assam where he was the chief ministerial candidate. Modi said he was "very happy" to learn that Sonowal had paid a surprise visit to the NIS even when everybody was anxious to know the results in Assam assembly polls. "The election results were coming. There was expectation of his assuming the new responsibilities as chief minister. Still, if my colleague is so concerned about his task as the sports minister, it gives me immense pleasure. I am sure we all will similarly understand the importance of sports and encourage sportspersons," he said. He also referred to Under-17 FIFA World Cup being hosted by India next year and said he was happy to see excitement for football picking up in the country in run up to that event. The prime minister talked about the results of CBSE board examinations declared recently. In this context, he urged parents to not pressurise their children to get more and more marks. "Dissatisfaction is a reflection of negative mindset...Dissatisfaction can lead to failures... Accept whatever result has come, welcome it and move forward.... Life does not stop because of bad marks...The most important thing is not to lost confidence," he said, while giving examples of two students whose parents were not satisfied even after they obtained over 89 per cent marks. He mentioned how Pandit Shiv Kumar Sharma had made 'Santoor', "which once used to be confined to Kashmir only', a worldwide name. Similarly, Ustad Bismillah Khan had made 'Shehnai' world famous even though it used to be confined to courts of the rulers earlier. Turning to the International Yoga Day on June 21, Modi said it should be celebrated across villages, cities and even in offices. He asked countrymen to check out early the "syllabus" for this year's Yoga Day curriculum so that they can start practicing them well in advance. "The Yoga Day has been accepted by the world...It should not be only an event but people should practice it regularly," he said, adding that it was essential for an "illness-free" living.